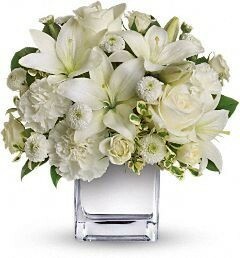 An enchanting bouquet of unmatched beauty and grace. 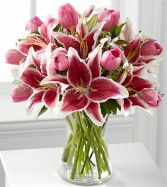 A softly elegant bouquet of pink roses and white calla lilies, seated in a clear glass vase, creates a magical display of your most heartfelt sentiments, to take an occasion from special to extraordinary. 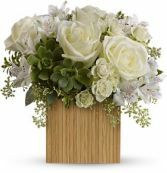 White Polar Star Roses, white peruvian lily, seeded eucalyptus and succulent blooms tucked into a pave style arrangement in a bamboo square vase. 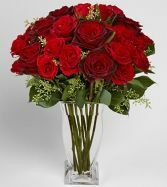 A bouquet of a dozen classic red roses, red spray roses and assorted greens is presented in a 7-5/8" modern glass vase. Better has 17 roses, Best has 24 roses. All roses are premium long stem roses from Ecuador.